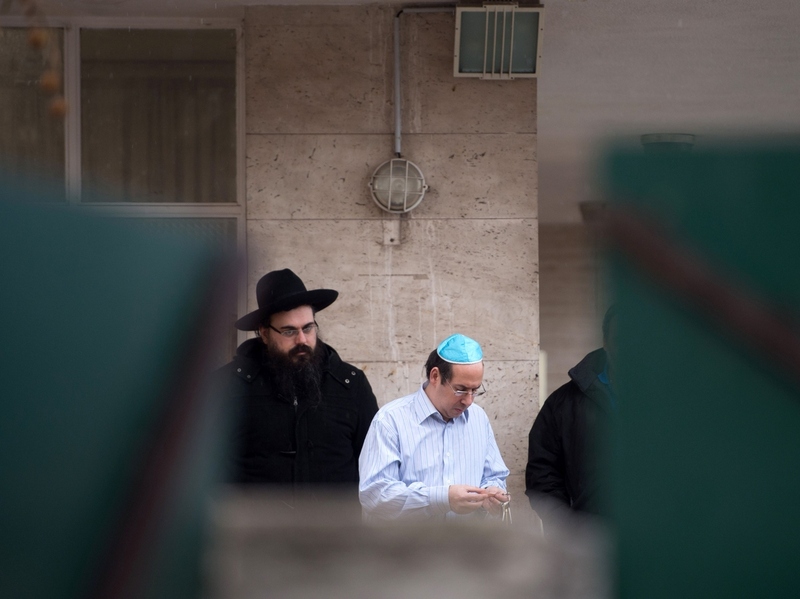 After Attack, An Uproar Over A Call For French Jews To Quit Wearing Yarmulkes : Parallels A Jewish community leader in the southern city of Marseille has sparked controversy by calling on Jews to stop wearing skullcaps after a teacher was the victim of an anti-Semitic attack. 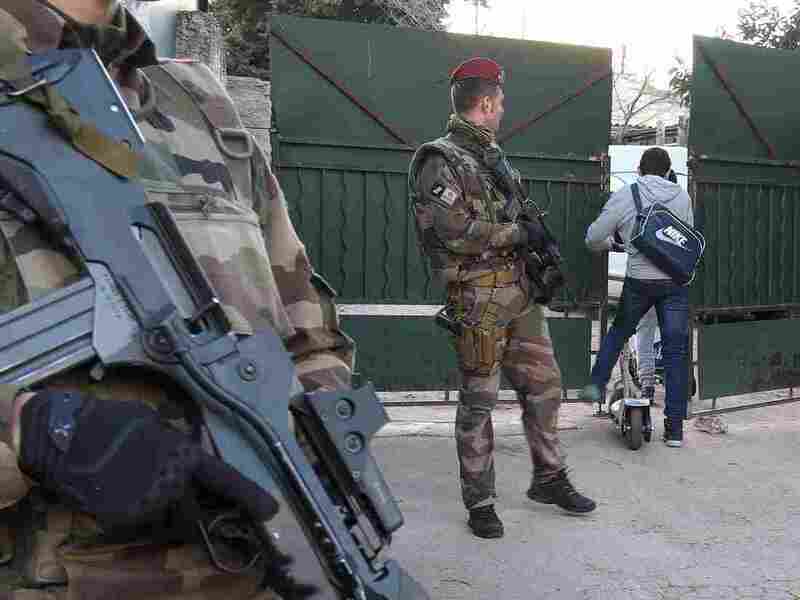 French soldiers guard access to a Jewish school in Marseille a day after a teenager wielding a butcher knife wounded a teacher. A debate is raging in France over whether Jewish men should avoid wearing the traditional yarmulke, so as not to identify themselves at a time of increasing violence by young radical Islamists. The proposal was put forth this week by a Jewish leader in Marseille, following a knife attack on a local Jewish teacher. Zvi Ammar, head of Marseille's 60,000-strong Jewish community, suggested it might be better if Jews in Marseille stopped wearing the yarmulke, also known as a kippah. "For the time being," Ammar said, "at least until these barbarians calm down." He was referring to a Kurdish immigrant from Turkey, a high school student, who attacked a Jewish teacher with a butcher knife and claimed to be inspired by Islamic State. The assault on Monday in Marseille horrified the country. But there's also been a strong reaction to Ammar's proposal. Jewish teacher Benjamin Amsellem leaves police headquarters in Marseille on Tuesday, the day after he was stabbed by a teenager. Amsellem's attacker told police he was acting in the name of the Islamic State. Amsellem has taken to wearing a baseball cap since the attack. France's head rabbi, Haim Korsia, called it defeatist. "To suggest this is like saying Jews bear some responsibility for being attacked," said Korsia. "This is the same kind of thinking as those who would say a woman is guilty of a sexual assault because her skirt wasn't long enough." French officials on the left and right have denounced the proposal for Jews to remove their yarmulkes. Parliamentarian Xavier Bertrand spoke about it on a popular radio show. 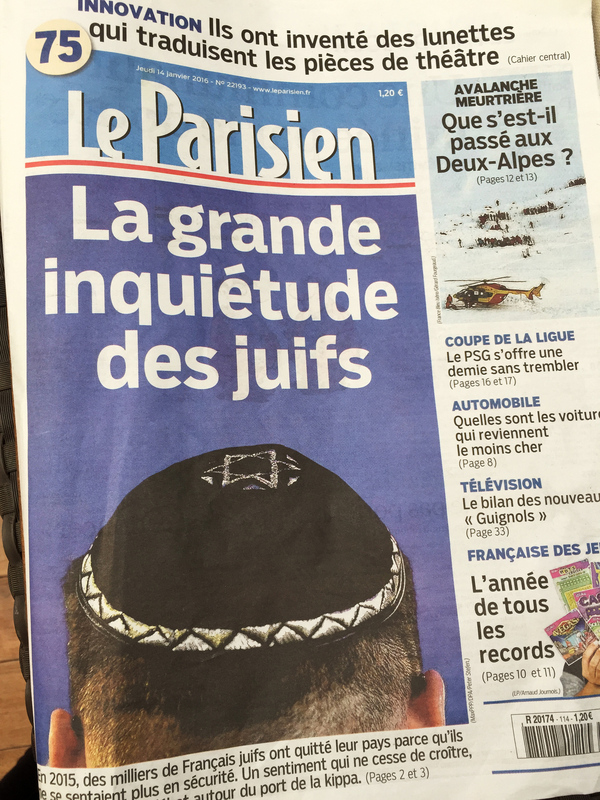 "If the Jews of Marseille don't wear their kippahs, France is no longer France," he said. "Because it will mean letting those who want to change our way of living and values win. We can't let that happen." Several of the recent terrorist attacks in France have specifically targeted Jews. France, home to 600,000 Jews, has Europe's largest Jewish population and the third largest in the world, after Israel and the U.S. But in recent years, Jews have been leaving the country. The daily newspaper Le Parisien reports that not since 1948, the year Israel declared statehood, have so many Jews left France. Some have left for economic reasons; some out of fear. The cover of Le Parisien newspaper, headlined "The big worry of Jews," highlights the debate over whether Jewish men should stop wearing yarmulkes following recent attacks targeting Jewish people in France. National Jewish community leader Joel Mergui says Jews know that wearing the kippah could make them the target of young radicals. "But we're not going to stop going to sporting events at stadiums or to concerts or cafes," he says. "And so Jews will continue to wear the kippah." After last year's attacks on satirical newspaper Charlie Hebdo and a kosher supermarket, an Israeli journalist secretly filmed himself walking through some of Paris' rougher immigrant and Muslim neighborhoods while wearing a kippah. Broadcast on French TV, the clip shows him drawing some unsavory comments. One group of young men wearing hoodies can be heard comparing him to a dog. French Interior Minister Bernard Cazeneuve is in Marseille, visiting the teacher who was attacked — said to be psychologically shaken but physically fine. Cazeneuve is also there to reassure the city's Jewish community. Bertrand, the parliamentarian, said it is the French state's job to protect its citizens — and it would protect French Jews. Ten thousand French soldiers are serving across the country, providing security along with police. Nowhere is their presence more visible than in the Marais, Paris' traditional Jewish quarter, where soldiers with assault rifles patrol the streets and stand guard outside the synagogues. Members of Marseille's Jewish community gather in front of a Jewish school after the attack took place on Monday. Clothing shop owner Stephan Levy says he feels safe, but things have changed in the past couple of years. "Now I think it's less risky sometimes to wear a baseball cap or a hat rather than a kippah, depending where you're going," he says. "And not just in France, in other countries too. Because, let's face it — these days, Jews are targeted." Teacher Avraham Scharbit is wearing his kippah. So is his 4-year-old son, who is buckled into a seat on the back of his father's bike. "Yeah, I sometimes wear a baseball cap instead of my kippah," Scharbit says. "The important thing is to keep your head covered. I do both. But it's not a big deal." Scharbit says he's not afraid — and says France is a good place to raise his children.